An artist's impression of a stray black hole that was detected at the edge of the W44 supernova remnant, located 10,000 light-years from Earth. 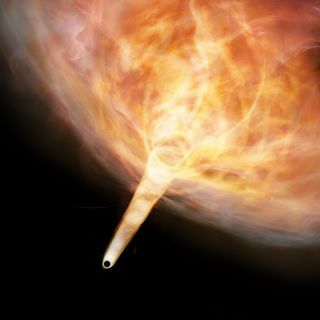 A stray black hole may be responsible for turning a gas cloud into a speeding cosmic bullet trillions of miles long. The wandering black hole was discovered lurking just outside a supernova remnant, a shell of expelled material left behind after a massive star explodes. Using the Atacama Submillimeter Telescope Experiment (ASTE) in Chile and the 45-meter (148 feet) Radio Telescope at Nobeyama Radio Observatory, astronomers found that the black hole had been previously hidden by a compact gas cloud emerging from the remnant. The supernova remnant, called W44, is located 10,000 light-years from Earth. The Bullet, which is about 2 light-years long [11.76 trillion miles, or 18.9 trillion km], is so energetic that it moves backward against the rotation of the Milky Way galaxy, according to the Nobeyama Radio Observatory statement. "Most of the Bullet has an expanding motion with a speed of 50 km/s [31 miles per second], but the tip of the Bullet has a speed of 120 km/s [75 miles per second]," Masaya Yamada, lead author of the new study and a graduate student at Keio University in Japan, said in the statement. "Its kinetic energy is a few tens of times larger than that injected by the W44 supernova. It seems impossible to generate such an energetic cloud under ordinary environments." So what could possibly send such a huge amount of molecular gas streaming out of the supernova remnant at such high speeds? The discovery of the hidden black hole may offer an explanation. The researchers developed two possible scenarios for how the Bullet might have formed. The first, called the explosion model, suggests that the cloud passed by a static black hole and was pulled in by the black hole's strong gravitational forces. This could have created a powerful explosion of gas that was spit back out into space, Nobeyama scientists said. Another theory, called the irruption model, proposes that a high-speed black hole tore through the dense molecular cloud, and the black hole's powerful gravitational pull left a stream of gas in its wake. Further research is required to determine which model best explains the origin of the Bullet, according to the study, published Dec. 29, 2016, in The Astrophysical Journal Letters. Although millions of black holes are thought to exist in the Milky Way, it is often difficult to locate them because they are completely black. However, this study has revealed a new way for astronomers to detect these types of elusive, stray black holes — by their influence on molecular gas clouds — that would otherwise float alone in space and remain unnoticed with no observable emissions, the scientists said in the statement.